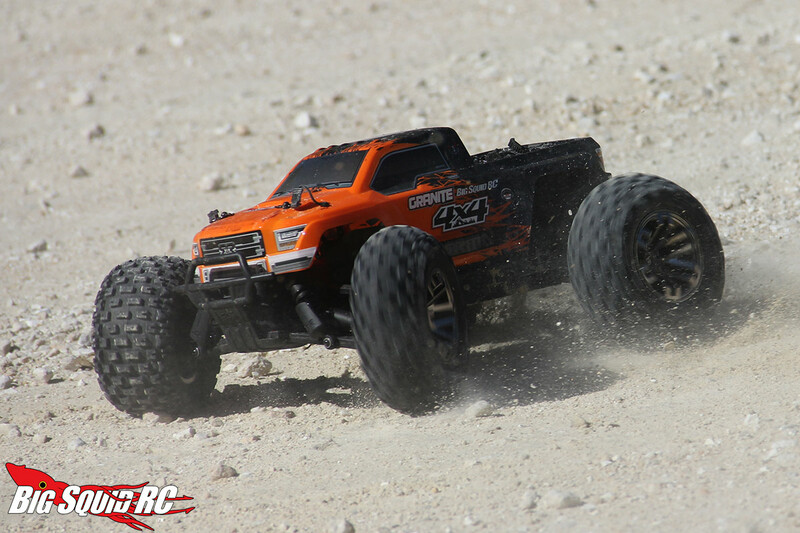 Review – ARRMA Granite 3S BLX 4×4 1/10 RTR Brushless Monster « Big Squid RC – RC Car and Truck News, Reviews, Videos, and More! 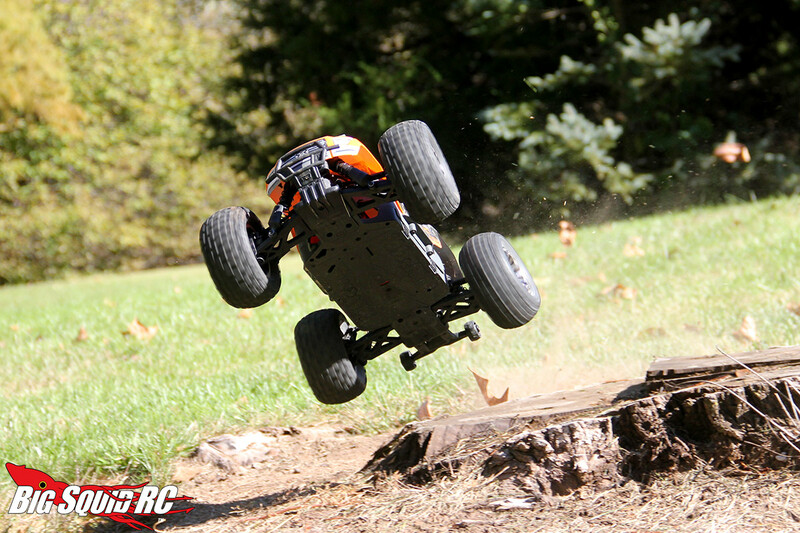 Wheelie on demand: Yep, that wheelie bar on the back ain’t just for show. Backflip off ramps: Oh yes. It loves to do this. What’s Needed To Complete: You need AA batteries for the transmitter and a battery for the truck. EC5 connectors are installed on the ESC, so you may potentially need other connectors if those aren’t what you run. Build Quality: Built well at the factory with the exception of one slightly loose wheel nut. 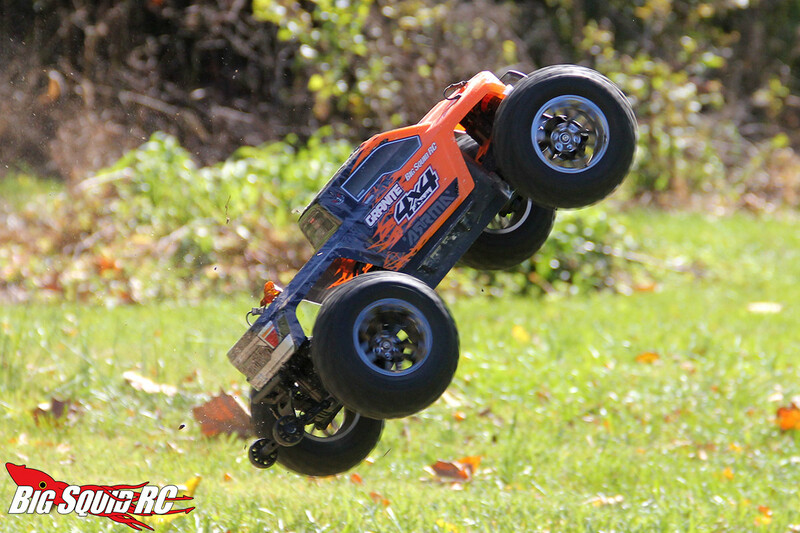 Test Drivers: Doug Welker, Claude Buster, Lily the Explorer and several Trigger King R/C drivers. 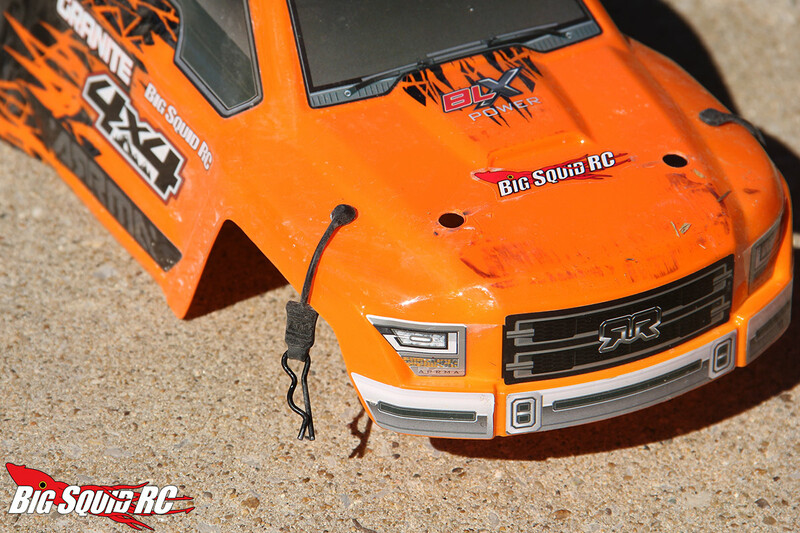 Set-up Notes: The truck comes with an EC5 battery connector on the ESC. While we have a couple of EC5 connector batteries, we have a TON of DEANS connector batteries, and since we wanted to test some of our bigger packs, we eventually changed over to a Deans unit to match more of our batteries. We used 5200 3S packs and 8000 mah 2S packs. 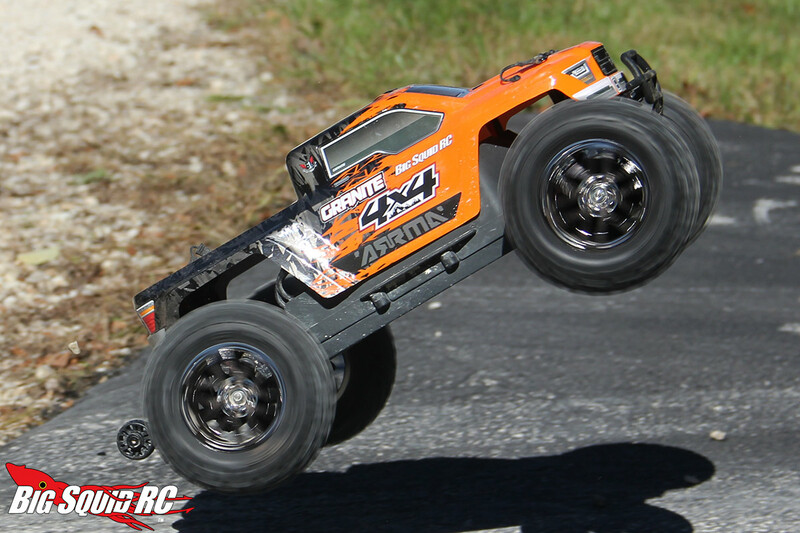 Turning: When driven at a slower speed or on a high bite surface, the Granite is an excellent handling 1/10 monster. 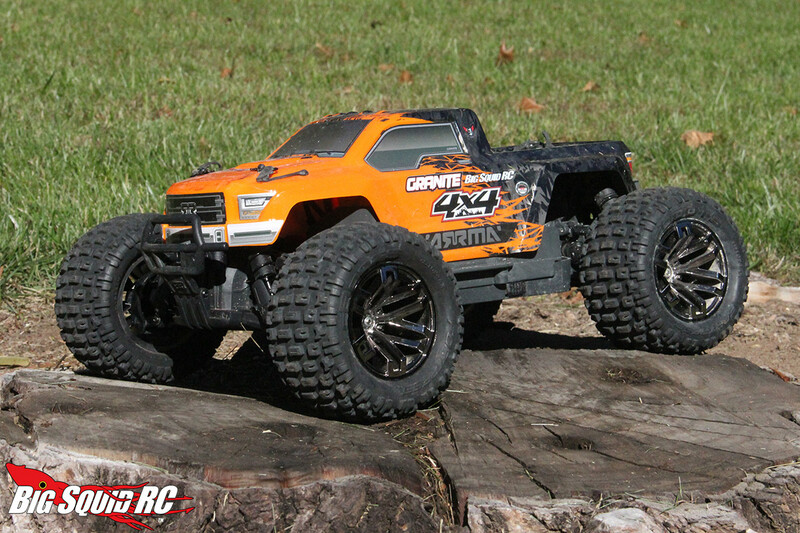 The weight is nice and low, which makes it feel “racier” than some of the trucks in its class. As your MPH rises, so does the difficulty in taming it. The servo does an adequate job turning the tires without feeling overly spongy, but that doesn’t do a lick of a good if the front end is in the air…which it’s apt to be if you’re hard on it. There are no sway bars either. So yeah, you’ll for sure want to lay off when going heavy into a corner. Oh, and if you do slow down and burp the throttle while cornering hard, you can get the diffs to unload and rip some absolutely gnarly cyclone donuts! 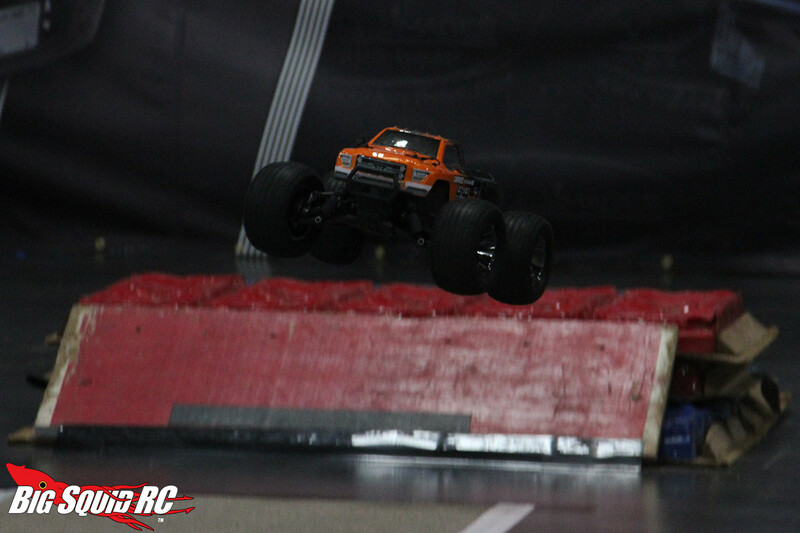 Jumping: With big power and a light curb weight, it loves to fly. You can easily pull controllable back flips and other stunts as it’s very reactive to throttle and braking input while airborne. You can also hit small items like garden ties, 2×4’s or even curb sides to send the truck into an iron wall jump. 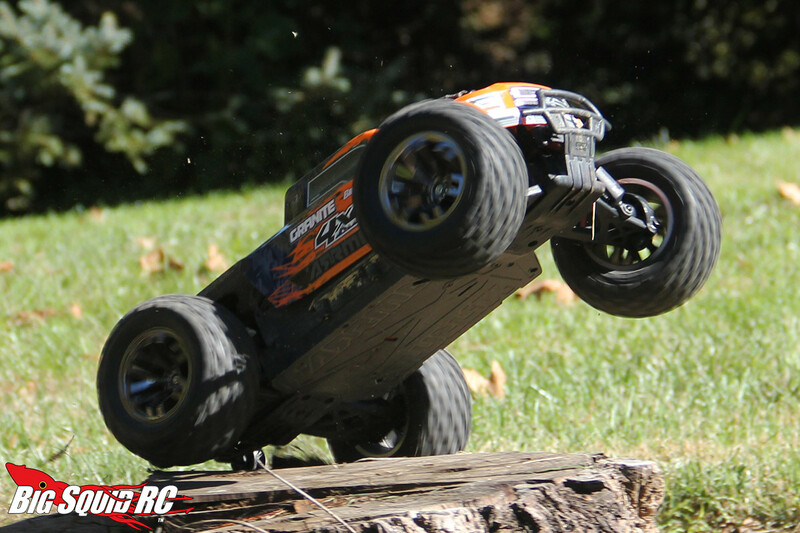 The low center of gravity and excellent weight distribution allow for it to fly straight and true….sort of like a short wheel base truggy. The beefy shocks do a great job of absorbing the impact and settling the Granite down. It was a freaking blast to jump. 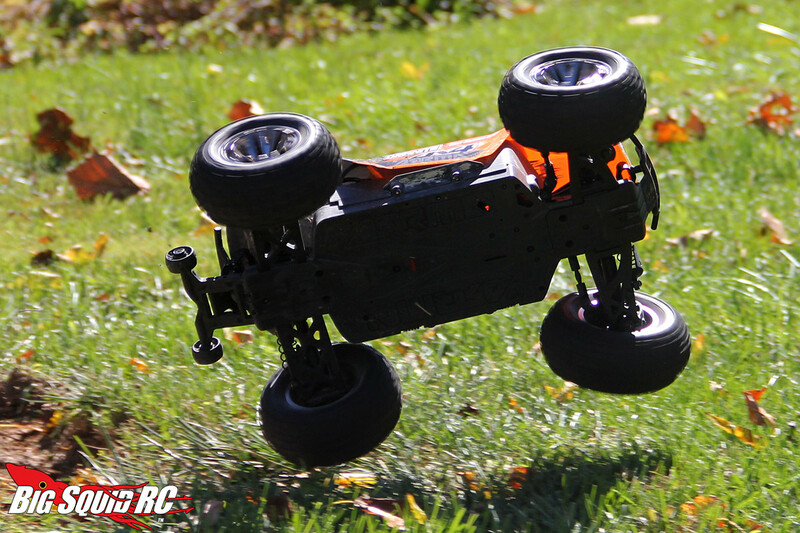 Bumps/Whoops: The suspension on the truck is great for pounding the whoops, and being heavy on the throttle allows it to keep up forward momentum with ease on rough terrain. 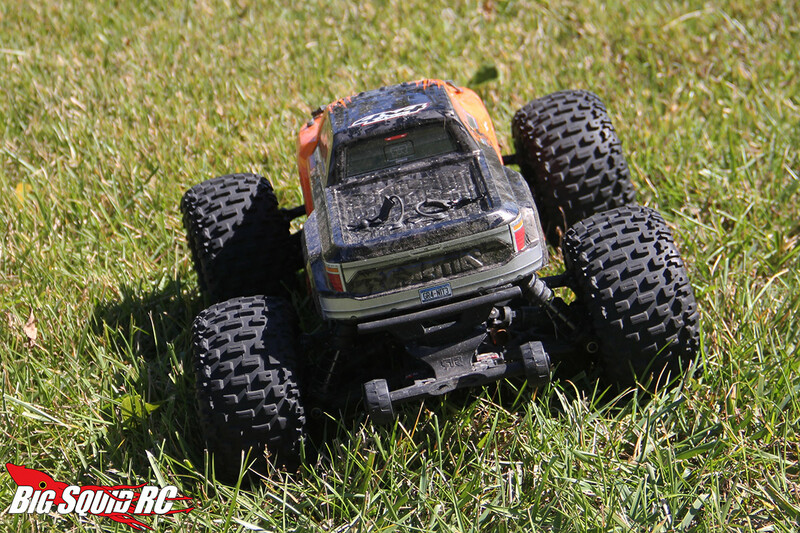 Just know that the short wheelbase can make it a tad tricky to handle on longer sections. On-Road: The Granite BLX 4×4 definitely likes the pavement. It’s a great parking lot bashing monster. While the term “glued” isn’t really applicable, we found that it handled pretty well on cement due to the grip provided. 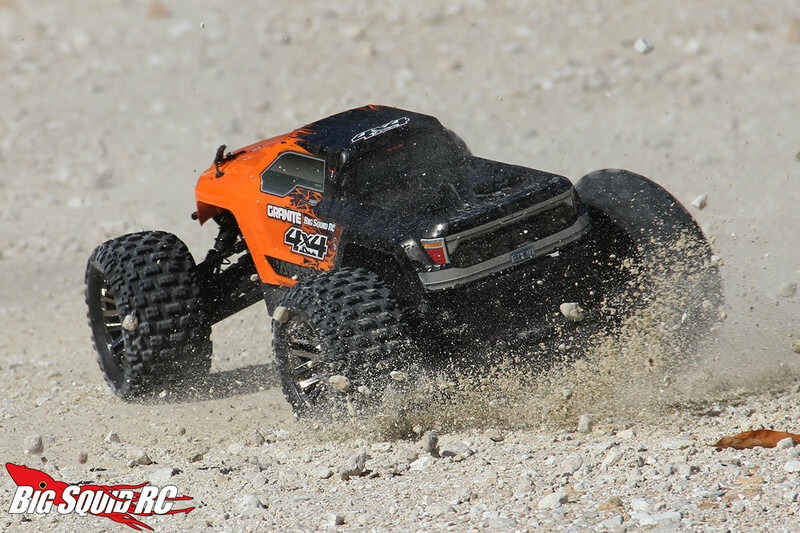 The truck LOVES to ride wheelies in this environment, and you can ride long ones if you have a deft hand on the throttle. Grass: A good deal of our testing was done in thick grass and the Granite absolutely tore through it with no problem. Leaves proved to be no match, either. 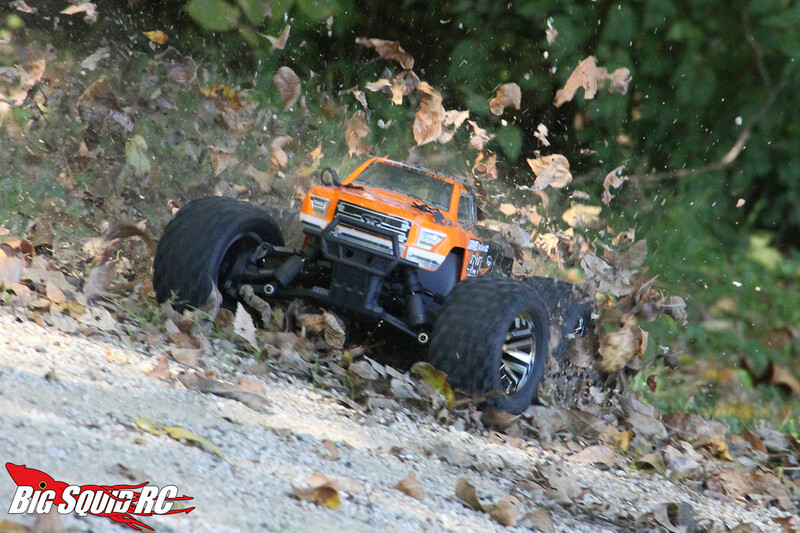 Due to the wheel speed, the truck likes to mulch thin grass so just be aware of that before you slap in a 3S pack and rip up Grandma’s yard. Tires: The dBoots Fortress MT tires are very tough and won’t wear much, even on pavement. They also resist going full-on pizza cutter very well. What they don’t do is provide a lot of grip. This isn’t a big problem if the surface has bite, like cement. However, if it’s loose (like gravel) the Granite can get VERY squirrely as the power is applied, sometimes making it almost impossible to stay straight under heavy throttle. All-in-all, our testers found them to be good general use bashing tires. They aren’t best in class, but they are serviceable. Power: This baby has LOADS of power on tap. The 3200kv brushless motor will launch this lightweight monster into the stratosphere, given you have the proper ramp. You can rip wheelies with ease on 3S, and most of the time on 2S as well. It’s a sensorless system, but cogging wasn’t much of a problem, especially on 3S. It was more noticeable when on 2S, but it still wasn’t THAT big of a deal. Something to note here is the truck appears to have a fail safe that stops the motor from running in a heavy bind situation (like when we tangled it in a bush). A quick flip of the power switch and it was good to go again. The motor was definitely warm after expending a full 3S battery, but it wasn’t red hot or burning. This is no doubt due to the large heat sink attached. We were impressed. Radio: The 2.4GHz Tactic TTX300 3-channel radio is a standard RTR unit. Throughout our testing there was no glitching. Ok ergonomics. It’s fine, but nothing to write home about, either. This is a very strong truck. 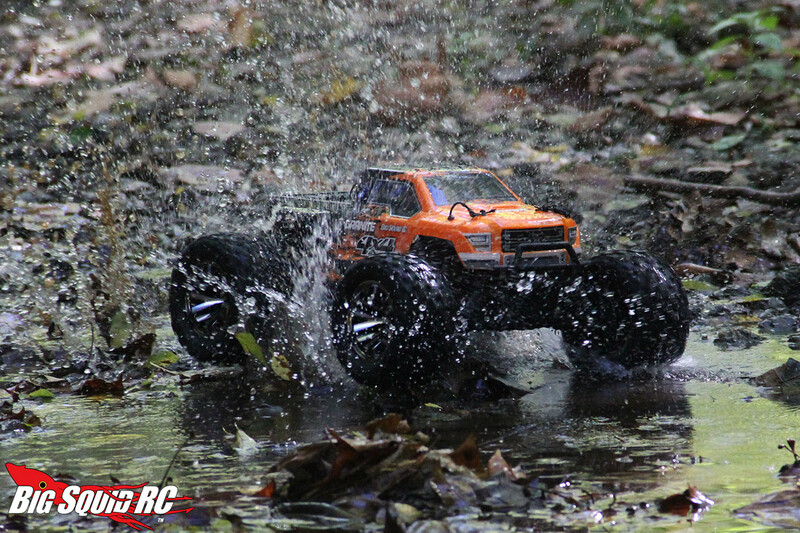 After flogging the truck during testing we broke nothing but did manage to spin out one of the rear hexes. As a testament to the strength of the rig, there was one thing that busted…but it wasn’t part of the Granite. 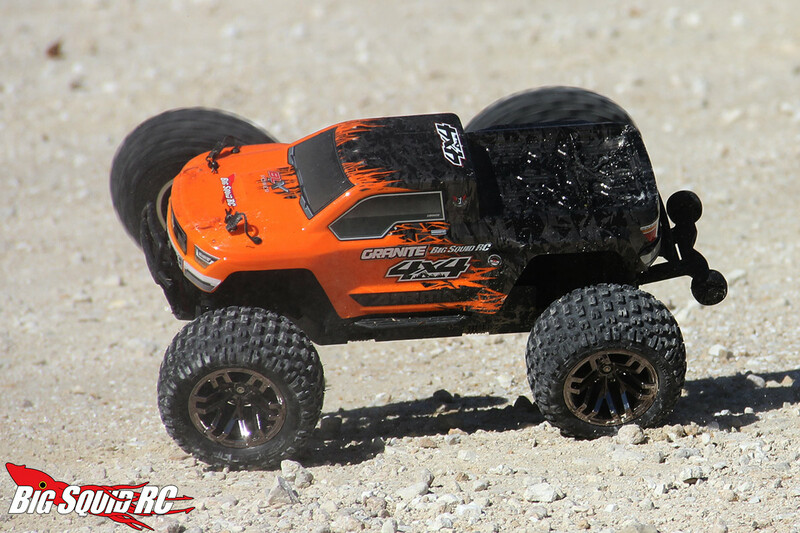 While we had the truck out on a freestyle course built for solid axle monster trucks, we flat landed it several times extremely hard from high altitudes on cement and it cracked our 3S Lipo case. Hey, the energy has to go somewhere I guess. You can see the hit at the end of the video below! We dig that the clips that are attached to the body. It was nice not being able to lose them when wrenching on a tailgate, as is usually the case with us. 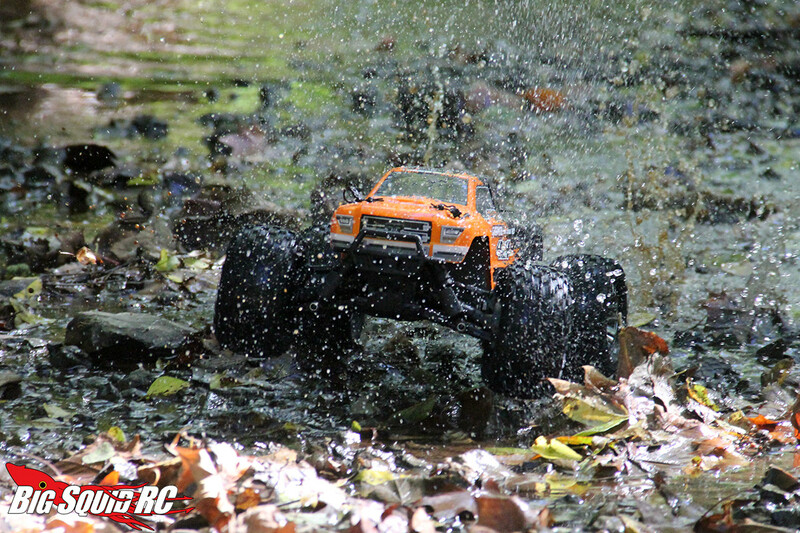 The truck is listed as waterproof, so we tested it out in a creek. It checked out just fine. 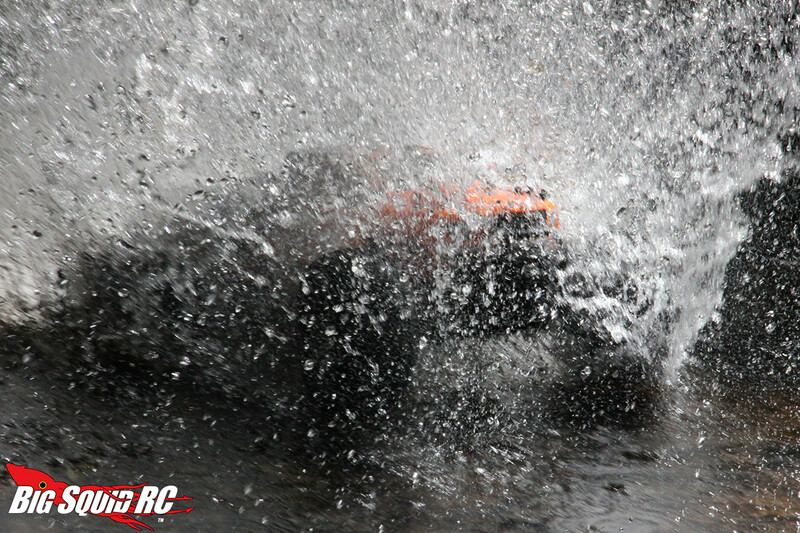 As a bonus, the truck loves to hydroplane when hitting the water at speed. Those of you that prefer to run vehicles on 2S versus 3S shouldn’t be deterred by the “3S” name in the title. While the truck is more fun with more power, it’s still a lot of fun on 2. Cogging is a tad more noticeable and the top end isn’t quite there, but as a trade-off the truck is a lot more controllable. If you are thinking of purchasing one of these for a youngster or noob, we would actually recommend starting with 2S. 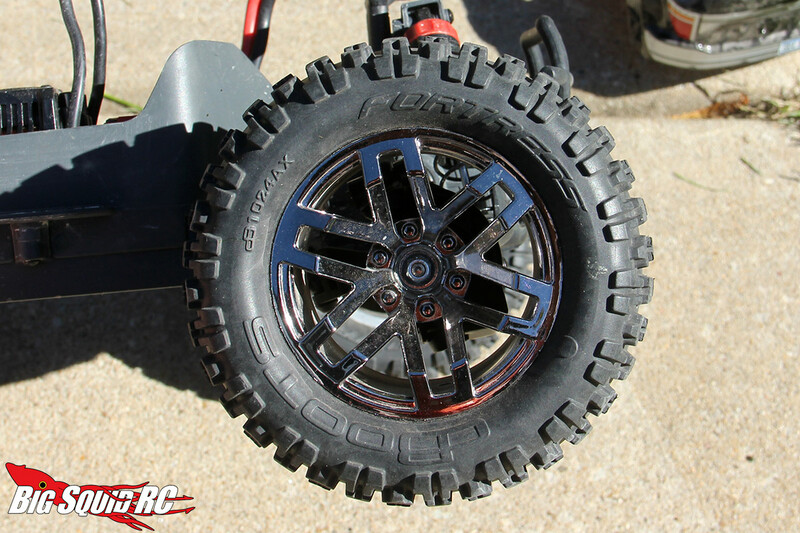 The chassis guard and shock shields do a wonderful job of keeping gunk out. The layout of the vehicle is excellent and it’s very easy to pull full assemblies out with just a couple screws. It just “feels” like a well engineered product. Best Mod: Heavier diff oil would probably be a good, cheap mod if you plan to run on a lot of loose stuff. A set of quality 1/10 monster truck tires like Pro-Line Trenchers would be a big upgrade though. That’s what we’d recommend to do first. 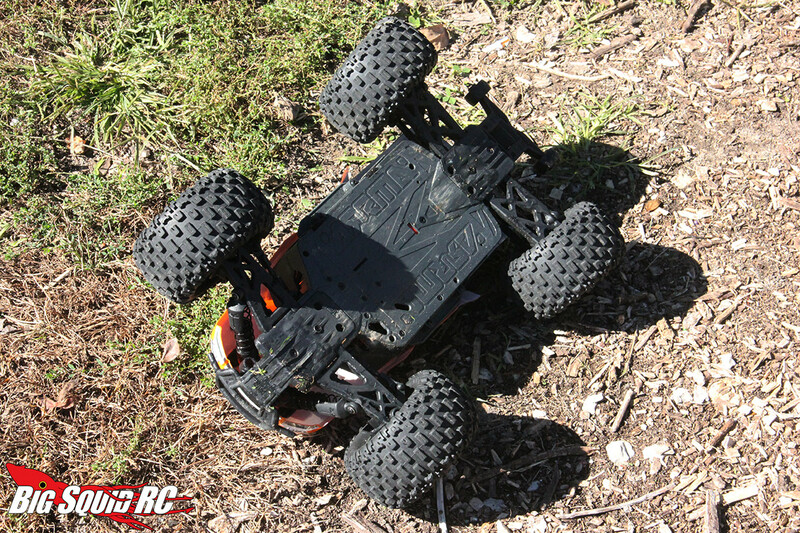 Time To Bash: B- Many hobbyists will probably have to change out the EC5 battery connectors on the ESC before they get going if they have a lot of Deans connected packs. 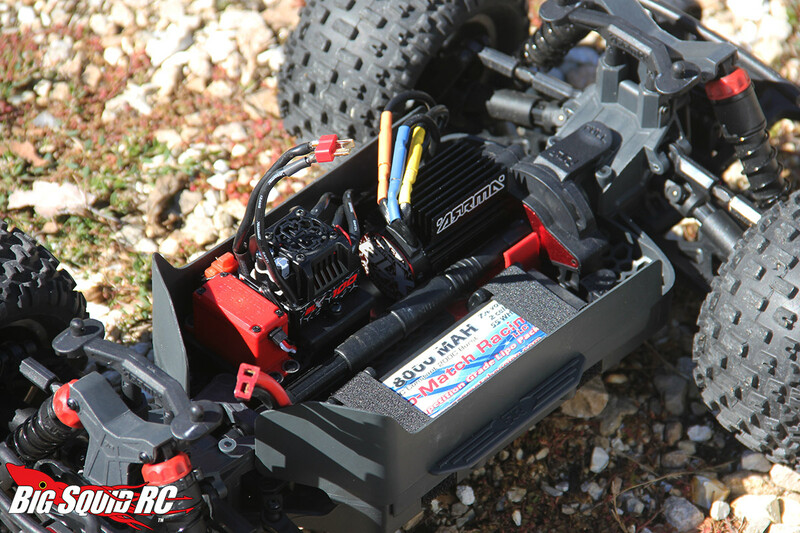 As many of the big Brands under Horizon ship with EC5’s, you’ll probably build up those connectors in your battery collection. Other than that, it was ready to go after adding batteries. Workability: A+ The Granite feels very well engineered. You can access almost any assembly by removing a few screws. Very easy to work on and pull maintenance. Good hardware. Car Show Rating: B The unlicensed pick-up body looks great with the color combo and wheels. Still, we wouldn’t necessarily call it best in class in this category. Bash-A-Bility: A+ The truck is 1/10 scale but comes loaded with parts that feel burly enough for a 1/8. The result is high powered tank that can take a wicked beating. 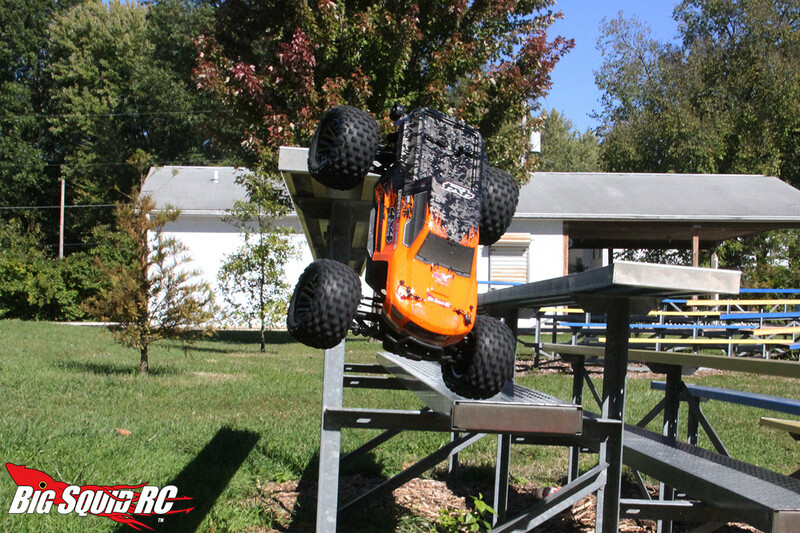 Fun Factor: A+ You can sky it out, run it fast, pop wheelies, do stunts….it can do a little bit of everything. You won’t be left wanting for power, either. 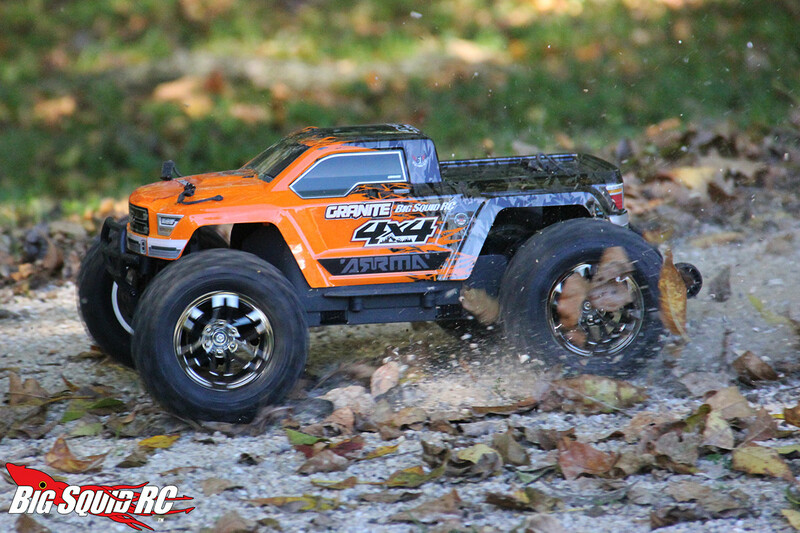 The Granite 4×4 BLX is an absolute blast to drive. 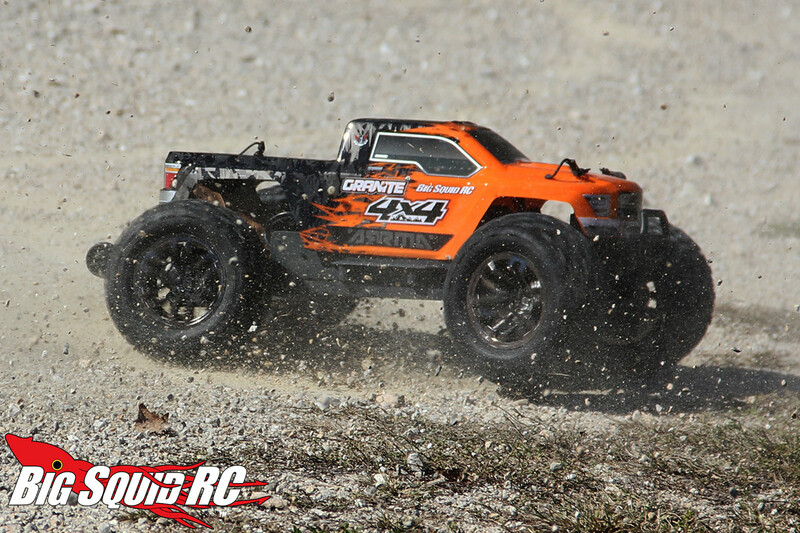 Handling: B- When you are driving on higher traction surfaces, the Granite handles pretty dang well for a 1/10 monster truck. 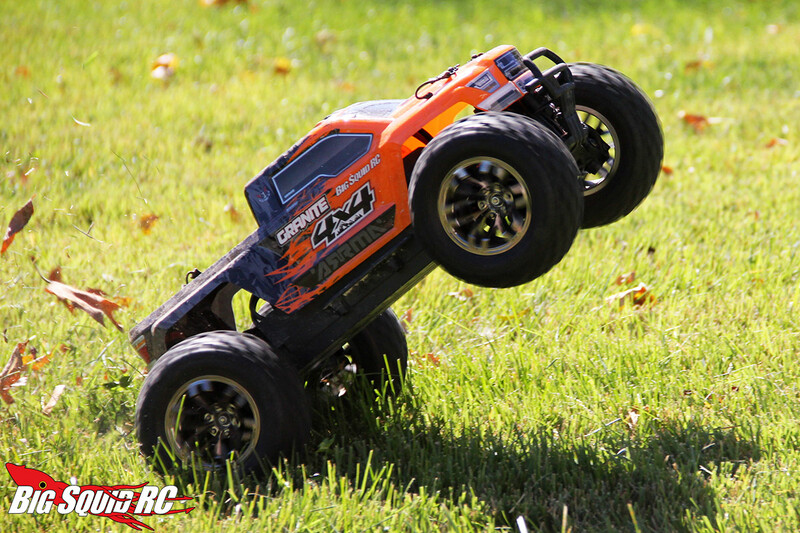 The low center of gravity lets it corner very well for a rig in its class. 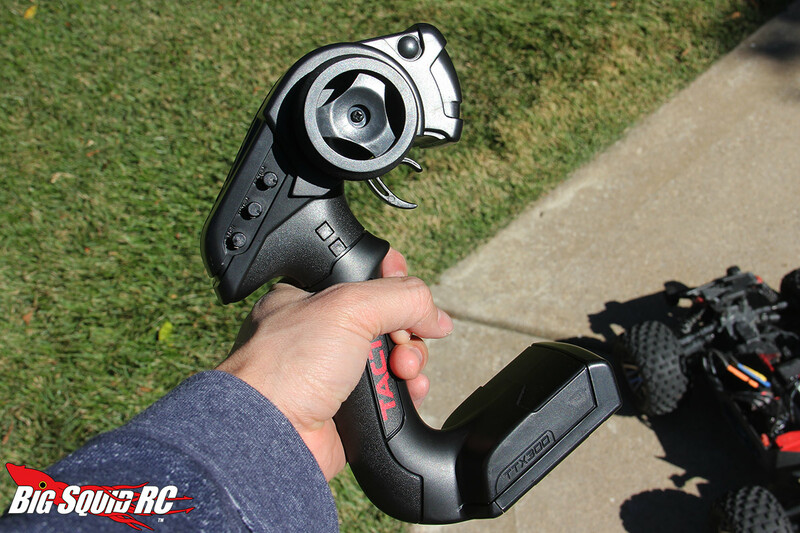 Once the grip deteriorates though, it can be a handful to drive on 3S power. Value: A+ For $299 you are getting a monster truck that is ready to absolutely throw down, straight from the box. We think that’s one heck of a value for under $300. 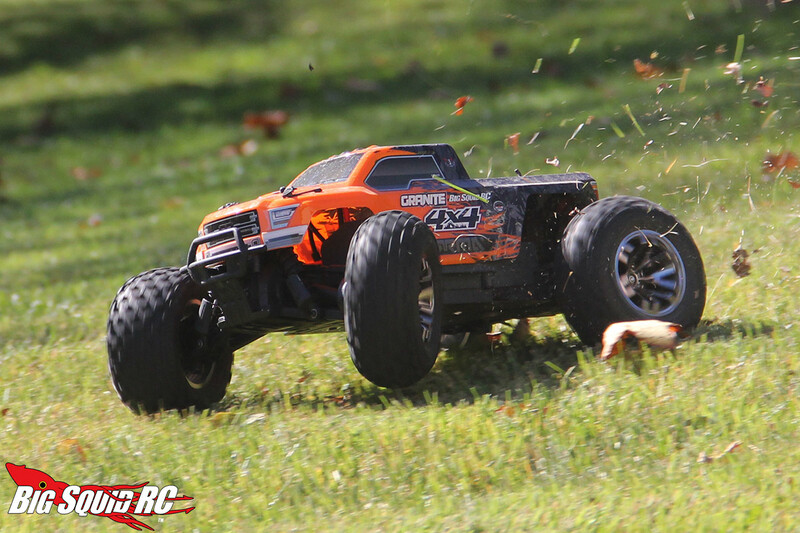 Parts Availability: B Arrma’s popularity means you’ll find parts on the pegs at many hobby shops and various aftermarket options online. 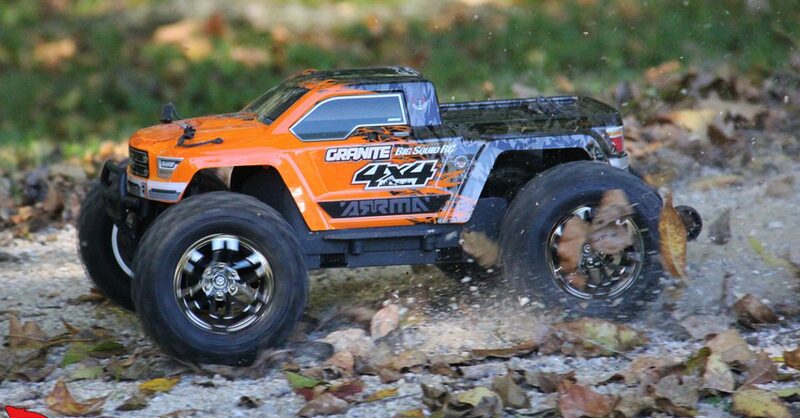 BigSquid Rating: A- The ARRMA Granite 3S BLX 4×4 1/10 RTR is a real beast of truck for an extremely reasonable price. 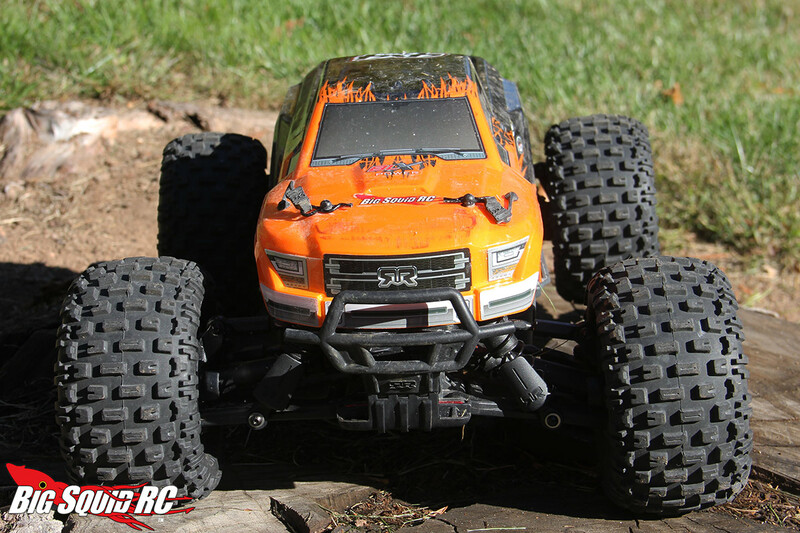 It’s rugged and a blast to drive. We give it our highest recommendation.